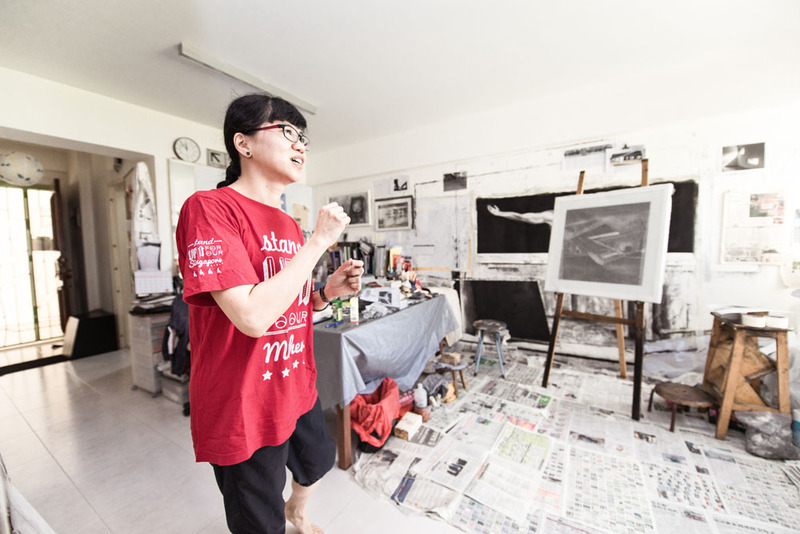 Ling Nah’s drawings explore urban transitory spaces in Singapore. 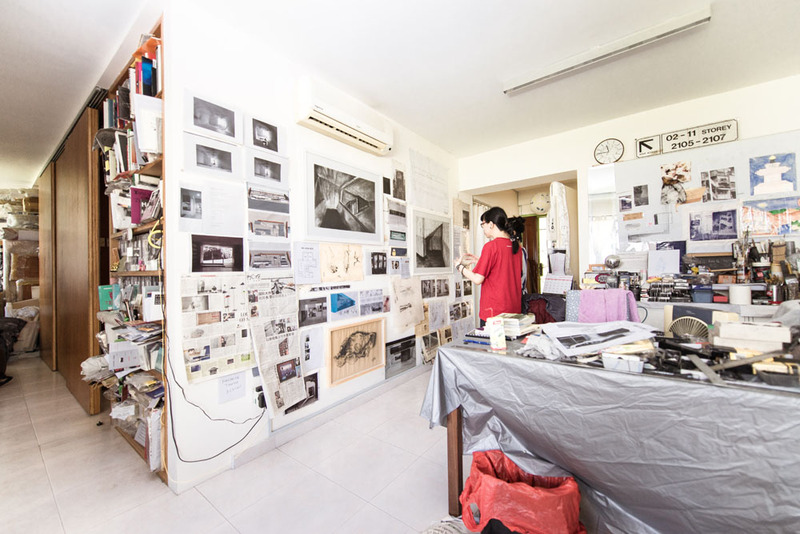 She focuses on the non-living but these spaces speak a lot about how we live and construct our daily activities. 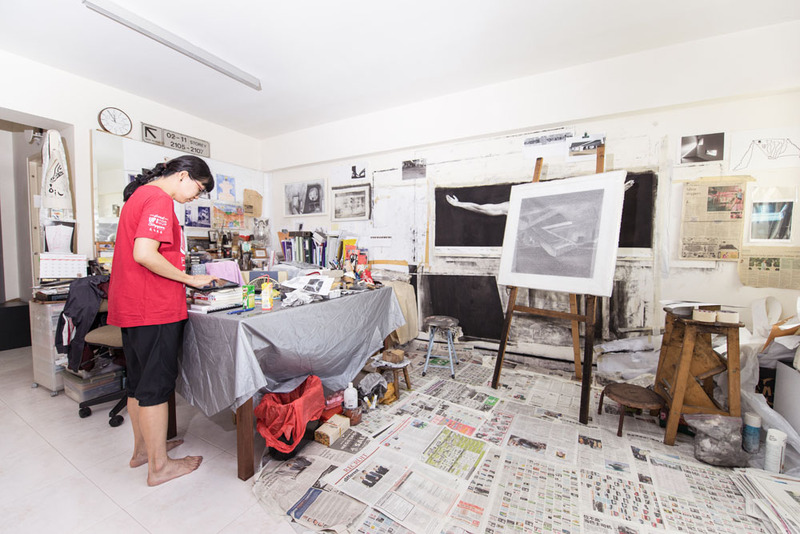 Like her charcoal drawings, her HDB flat in Admiralty (although not a transitory space) tells us stories about her life. 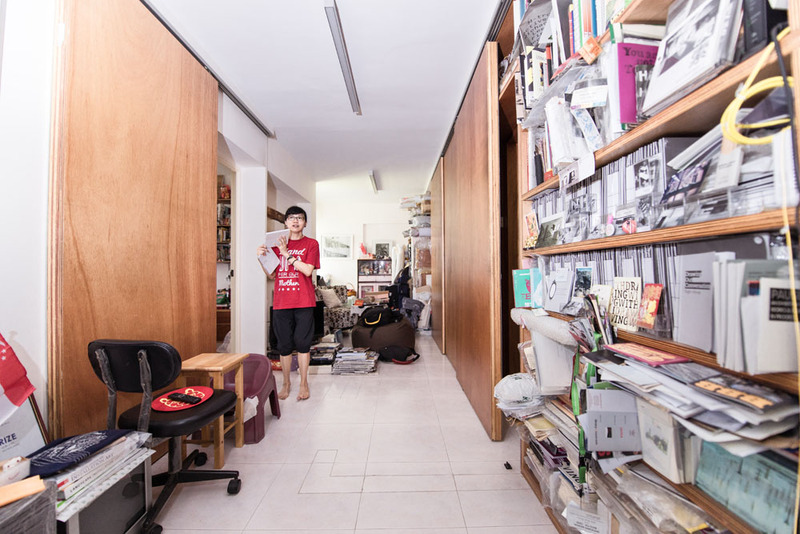 From her bedroom shelves which are filled to the brim with classic comics from Hong Kong and hoards of eccentric plastic toys, to the walls of her living room that are plastered with sketches, ideas and newspaper trimmings, we learn about what excites and inspires the Singaporean artist. How is it like living in a flat that is your living, working and storage space all at the same time? It is important to demarcate the areas. Living and working in the same space helps me cut down on travelling time, but it is easy to get distracted by things lying around the house. I knew that I needed discipline in keeping my different activities separate, so when I was working with FARM to design this space, I made sure that different rooms remained partitioned for different activities. For instance, I kept the kitchen, the bathroom, laundry area and bedroom separate. One of the bedrooms was converted into a storage space which houses a library and my past works. The living room is my studio, the main working space. 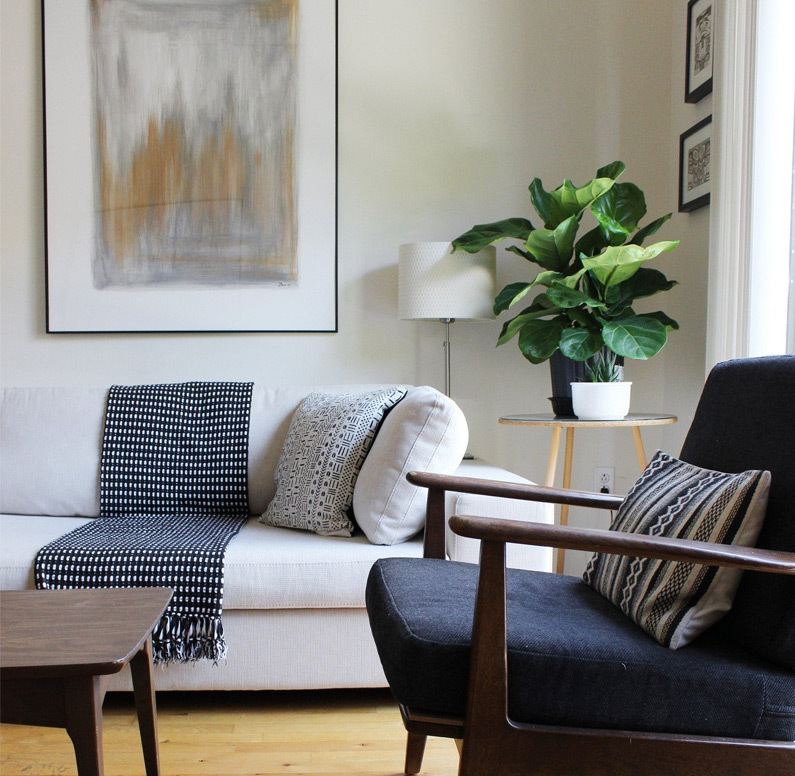 It not only overlooks a big green field but is bright and airy – these are important meditative elements for me to work in and the wall also doubles up as my canvas whenever I have to work on large installations. The master bedroom was taken away so that the studio area could open up into a bigger continuous hall which was intended to be a “gallery” although this space functions more as additional working area now as I tend to get messy. FARM also created a small reading room at the back, where I could sit by the window and think, read, dream. But because I’m such a hoarder, this space is pretty much filled with all the exhibition catalogues and various books and publications that have accumulated through the years. I walk a lot, around the different parts of Singapore, wandering amidst the different neighbourhoods. Whenever I come across an interesting space, I take a quick photo which then becomes my reference for my sketches and drawings. 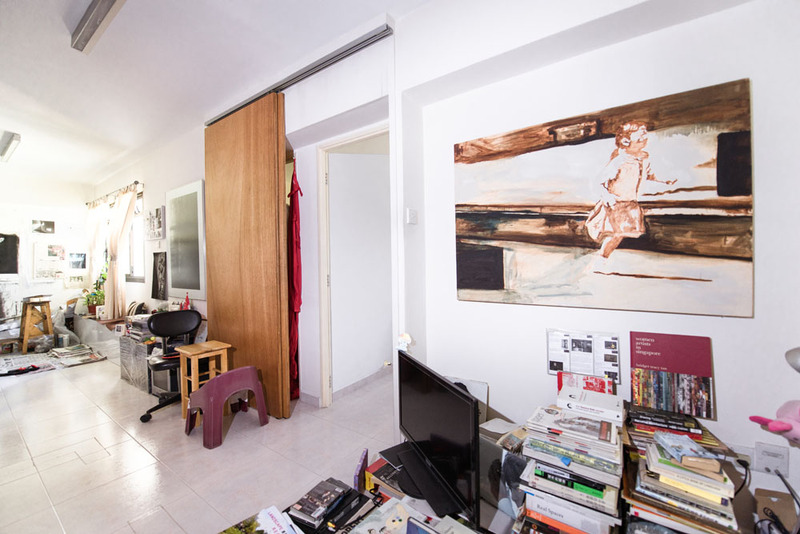 There are always new spaces to find in Singapore, especially the older HDB estates as they have very interesting alleys, walkways, void decks or stair holdings that people tend to overlook. I actually started off with figurative paintings. The acrylic and oil on canvas painting titled “Nostalgic Run” hanging on my “gallery” wall has a special sentimental value to it. 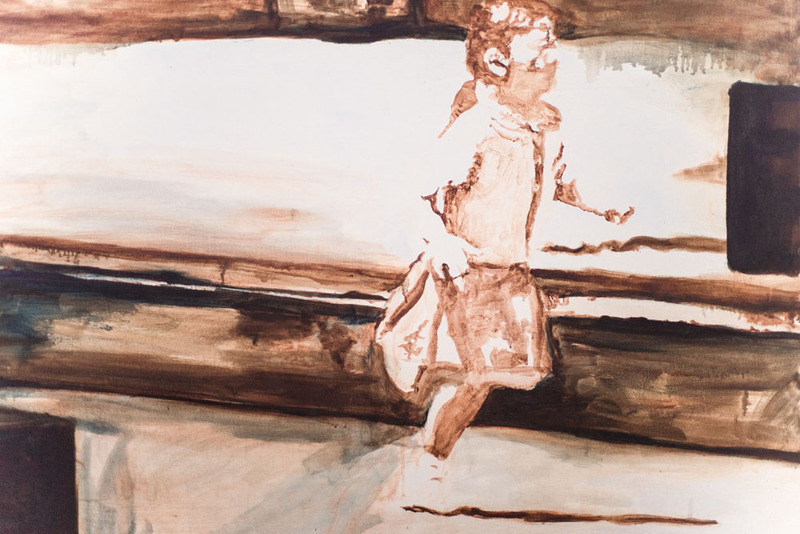 It is of a girl in kindergarten uniform running around in Raffles Place. Back then, I paid more attention to capturing the movement of the figure rather than concentrate on the architectural composition of the background. I won an award for this painting; however I wasn’t satisfied as I found the brushstrokes stiff from applying layers of acrylic/oil paint. I much prefer the accidental, gestural marks that are created from drawing with charcoal. You can see and feel so many things happening within such marks. I use the technique of chiaroscuro, where the extreme sense of light and dark is crucial in my compositions. For me, the colour black is a form of weight, as opposed to the colour white which invokes a sense of lightness. 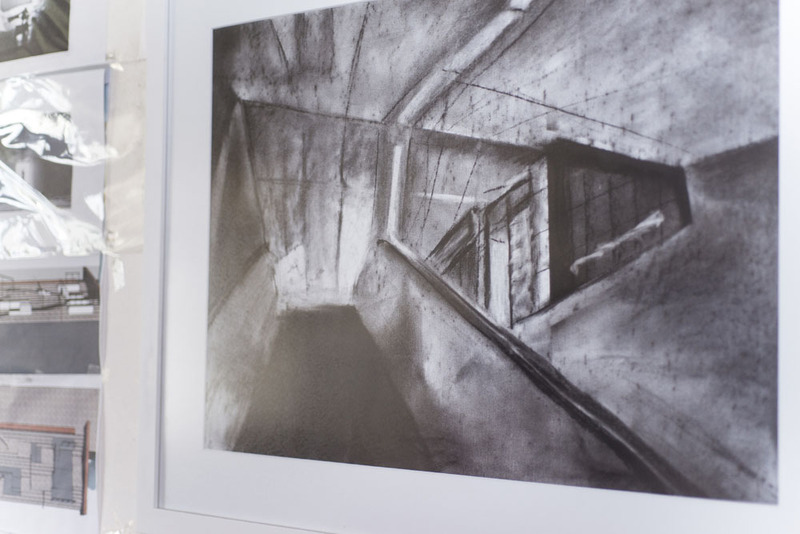 Whether in drawings or in the larger-scale site specific installations, I would start on the black areas first which would centre the rest of the composition. I dream in black and white and I didn’t realize that this is not normal until very recently! 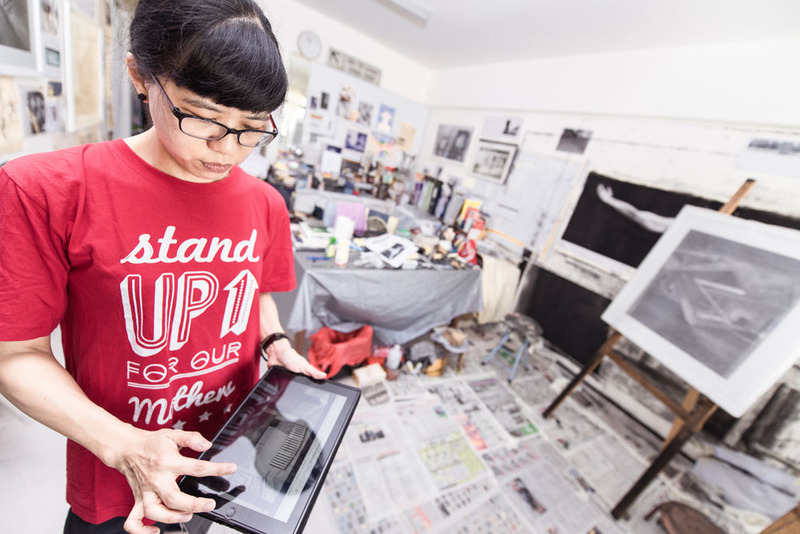 Do you have any practical advice for collectors of your work? Contrary to common perception, charcoal survives well in the Singapore humidity. 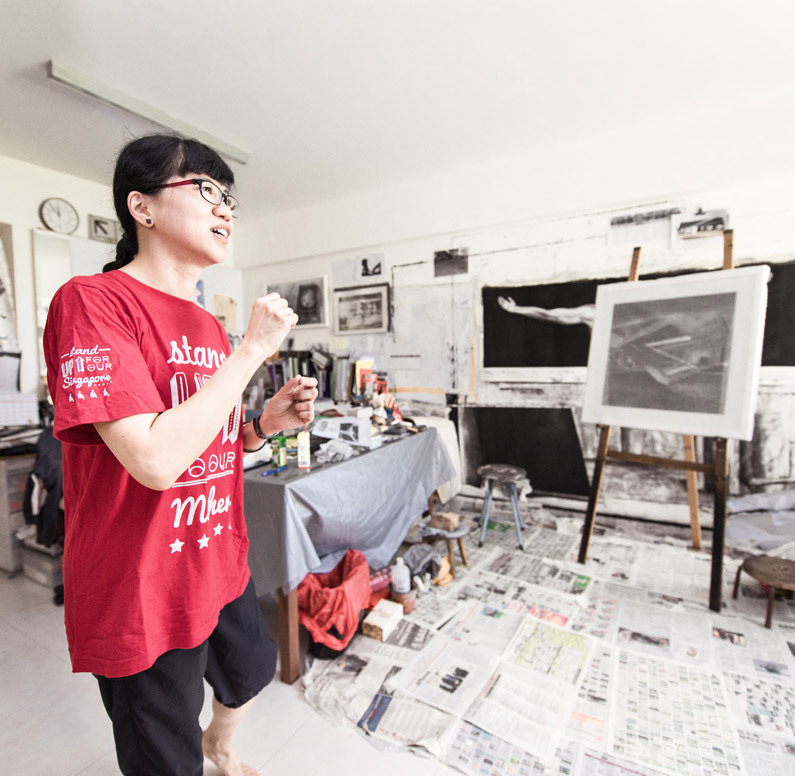 I have a charcoal drawing on my studio wall currently and because I keep the windows open, the wall has had much exposure to sunshine and moisture which hasn’t actually affected the drawing. On the other hand, paper is the sensitive element. I tend to use textured watercolour paper (minimum 250 gsm) as it is more robust and preserves better. Archival framing is important in helping to preserve paper works. As I don’t have a humidifier at home, I try to keep the works above ground as much as possible.